About twice a week, I get a call that a Dymo LabelWriter 450 no longer works. In most cases, the reason was that the user pulled the USB cable. My Dymo LabelWriters are connected to a Dymo printserver. While the printservers can be monitored using ping, this does not allow you to see if the printer it still connected to the printserver. Luckily the Dymo printserver has SNMP support with the option to see what device is connected. echo "Printer disconnected from printserver"
This script can be used with Nagios to monitor the LabelWriter. Dit bericht werd geplaatst in IT op december 21, 2013 door David (admin). I've personally tested all three methods, and on my Fedora 18 machine, they all work. Dit bericht werd geplaatst in IT op december 20, 2013 door David (admin). One of the computers I manage had a problemen with Windows Photo Viewer, which crashed with the message "COM Surrogate has stopped working". Especially when clicking "Next" in the viewer, the application crashed. It's a 64 bit Dell computer running Windows 7 with all updates applied. It has a Trend Micro virusscanner and a TightVNC 2.x server for remote management. Often, COM objects are defined in DLLSs, a piece of code that is executable, but just not by itself. It is started by another program when needed. But sometimes, you just want to run code from a DLL without writing a complete wrapper program around it. That's where Microsoft has provided a program that can execute parts of a COM DLL without developing a complete program to load the DLL. 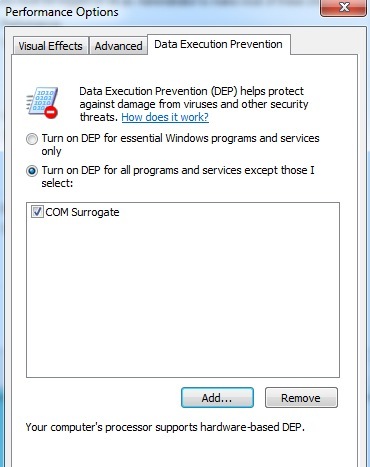 What can I do against a crashing COM Surrogate? I read several solutions, most of which were useless to me, but they may help you. In my case, the issue was that the drivers of the onboard video card crashed. The computer is an Optiplex 9010 with an Intel® Q77 Express Chipset (Intel® BD82Q77 PCH) chipset that has Integrated Graphics. I inserted an ATI Radio HD34xx card, which was automatically installed by Windows 7. After a reboot, the problem seems to be completely gone. Bad sectors on the hard drive could be the cause of COM Surrogate crashing. You can check your disk with the chkdsk command. Another fix that is suggested by numerous websites, is adding dllhost.exe to the exception list of DEP (Data Execution Prevention). Although this MAY be a fix, I really suggest you don't use this method. The dllhost.exe is an executable that runs a crapload of DLLs, both Microsoft-DLLs and Third-party DLLs. It's like telling your virusscanner to exclude *.exe from scanning. If it were your financial software, I would not advice against it, but dllhost.exe is used by so many programs, that I don't consider it safe to exclude. Dit bericht werd geplaatst in IT op oktober 10, 2013 door David (admin). Recently, I noticed that I had a tab opening in Firefox with the URL https://r.twimg.com/jot in a new tab. Apparently, when visiting RSS feeds in Thunderbird, this tracker is opened in another tab, which is quite annoying. I've read a lot of solutions to this issue, most of them being changes in the settings of either Thunderbird or Firefox. Probably the best solution was to deny ||r.twimg.com/jot through ad block plus. Dit bericht werd geplaatst in IT en getagged met Firefox, Thunderbird, Twitter op mei 28, 2013 door David (admin). When experimenting with IPv6 this weekend, I thought it would be cool to give my IPv4-only devices such as my webcam an IPv6 address. Using Tayga to do NAT64, I could route an IPv6 range to a virtual network interface where Tayga translates incoming packets to IPv4. As Tayga's documentation states: "You will need to select an unused /96 from your site's IPv6 address range which will be used as the NAT64 prefix." Unfortunately, I only have one single /64 available, a range that should not be split. This is not really best practice, as hosts in the range 2001:400:1234:567:ffff:0:0:0 - 2001:400:1234:567:ffff:ffff:ffff:ffff could be located on both the LAN and the Tayga virtual router, it's the only working method for the time being. The Linux router sends packets for 2001:400:1234:567:ffff::/96 to Tayga instead of direcly to the lan. This works for outside hosts, but hosts on the LAN don't know that packets for this range should be sent to the Linux router. They try to find my webcam on the LAN, but obviously can't find it. This looking for the webcam on the LAN is called neighbour discovery. The Neighbour Discovery Protocol performs functions similar to IPv4 ARP for finding other nodes on the same LAN. With above setup, the host at 2001:400:1234:567:ffff::1 is actually off the LAN. The Linux router must tell my laptop to send packets for this IP to the router. This means for the Linux router to generate Neighbour Advertisement messages in response to Neighbour Sollicitation messages for 2001:400:1234:567:ffff::1 that enter through eth0. Note that 2001:400:1234:567:ffff::1 itself is not found on eth0, but on another virtual interface. http://wiki.stocksy.co.uk/wiki/IPv6%2BXen_on_a_Hetzner_server_with_routing_to_dummy0_and_proxy_ndp - exactly what I'm doing, but for other purposes. Just found this page after typing my own. Dit bericht werd geplaatst in IT en getagged met IPv6, IPv6 transition, NAT64, Tayga op mei 13, 2013 door David (admin). Sometimes, when running 1 bash script repeatedly on several different machines, I found that being able to download and immediately execute a script is very handy. With bash, this difference is small, but with other commands, it may not be. Dit bericht werd geplaatst in IT, Linux en getagged met bash, Linux, shellscript op mei 3, 2013 door David (admin). Outlook: Where will sent items be saved? Some of my colleagues share mailboxes. They have a personal account and a shared account for the group. Their question was: where will sent items be saved? This is described on this microsoft kb article. If that doesn't work, try the hotfix from microsoft support. Dit bericht werd geplaatst in IT en getagged met Outlook, Sent items, Shared mail op mei 3, 2013 door David (admin). 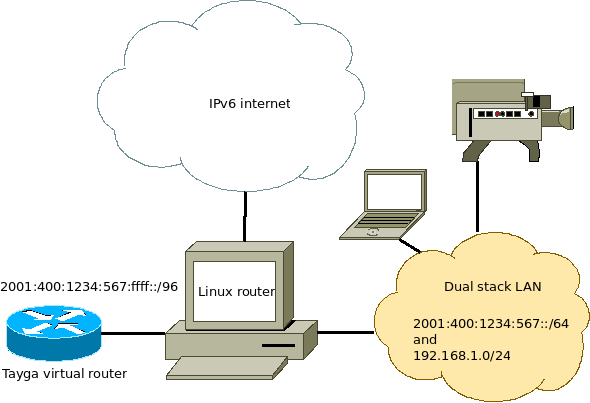 On most Linux distributions, the right hand part of the IPv6 address is based on the computer's MAC address. As your MAC address is fixed and (in theory) worldwide unique, your computer can be traced anywhere it goes online. While cookies track you all the time, stil having another tracker around is not desired. The "IPv6 Privacy Extensions" fix this by giving you a regularly changed random IPv6 address. Still, whenever you go online on a browser that carries your cookies/flash cookies/zombie cookies/supercookies, you may be identified. But at least, it's a little harder to track you. Dit bericht werd geplaatst in IT en getagged met IPv6 op mei 2, 2013 door David (admin). Sometimes, I receive digital invoices in PDF format with a password. That way I shouldn't be able to modify them and commit fraud. Unfortunately, this also makes it impossible to perform normal operations on them, such as removing unneeded specifications or merging all invoices into one single file. Luckily, most Linux distributions come with a tool that can be used to remove these passwords: ghostscript. While this does remove the password, I'm not sure if it does not degrade the quality of the file a little (I don't notice any quality difference, but if you use highres files, you may lose quality). Dit bericht werd geplaatst in Business, IT, Linux en getagged met digital invoice, ghostscript, Linux, password, password removal, pdf op mei 1, 2013 door David (admin).